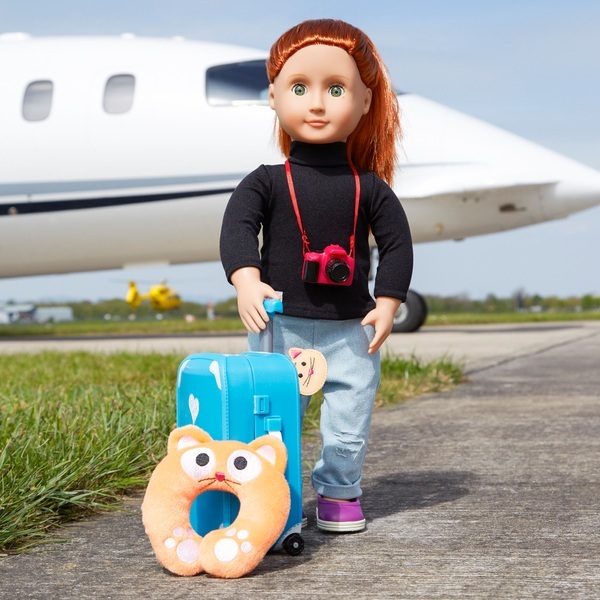 Our Generation Well Travelled Luggage Set has all you need to take your Our Generation doll on holidays. (Doll sold separately) Check she has all she needs before she goes. Don’t forget her passport and boarding pass. Contents: Luggage, a food tray, a macaroni container with a lid, a fruit salad container with a lid, a bread roll, a cup, a fork, a spoon, a butter packet, a jam packet, a pack of gum, a bag of candy, a pack of crackers, a world map, a passport, a boarding pass, a boarding pass holder, a sheet of luggage stickers, a travel journal, a camera, a pen, a travel pillow, a luggage tag, a toiletry case, a toothbrush, a toothbrush holder, a tube of toothpaste, dental floss, a tube of suntan lotion, a bottle of shampoo and a bottle of conditioner.